This Fallas store at 701 N. 13th Street is one of two in the city which are holding going-out-of-business sales. Parent company National Stores Inc. filed for Chapter 11 bankruptcy this month, and will close 184 stores, including eight in the Rio Grande Valley. 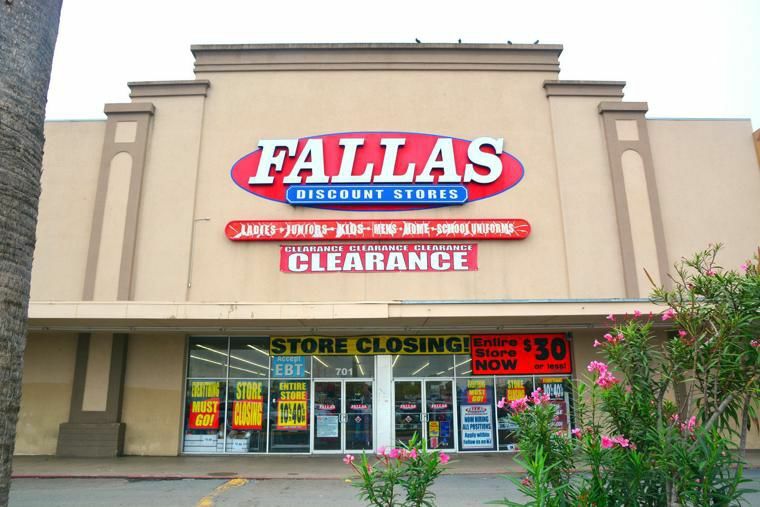 HARLINGEN — This month’s bankruptcy filing by National Stores Inc. will mean the closing of nearly 200 Fallas and related stores nationwide, including eight locations in the Rio Grande Valley. Harlingen stores, which sell school uniforms, apparel and home goods, will shut down at two locations, 509 E. Expressway 77 and 701 N. 13th St. Brownsville will lose three locations, and stores in Edinburg, Hidalgo and Pharr also will be shuttered. In all, 184 of Fallas’s 344 stores will be shut down, including 51 stores in Texas. All of these stores have begun close-out sales. National Stores has stores in 22 states and Puerto Rico, operating under the names Fallas, Fallas Paredes, Fallas Discount Stores, Factory 2-U, Anna’s Linens by Fallas and Falas (spelled with a single “l” in Puerto Rico). The Gardena, California-based family-owned business filed for Chapter 11 bankruptcy in Delaware, but “is committed to improving its financial health and returning to profitability,” National’s CEO Michael Fallas said in a statement. Fallas and the other chains carry discount merchandise, including clothing and school uniforms, bedding and household items. In its filing, National Stores executives said the bankruptcy was necessary due to underperforming stores and severe weather in some regions that depressed sales. The company also was victimized by a data breach last year. Customers’ credit card information was exposed at some stores, resulting in National being unable to obtain access to operating funds, officials said.